Recently, Microsoft Surface Pro 3 got unveiled in a Microsoft Surface event held in New York. Till now, Microsoft has failed to compete with iPad and PC as well as failed in convincing people in replacing the both. Do you think that Microsoft Surface Pro 3 can stand up with fulfilling all the expectations? Here we are with a brief preview as well as review of Microsoft Surface Pro 3. Microsoft Surface Pro 3 features 12 inches display along with Core i7 processor. During the event, maximum time was being spent on its comparison with iPad and MacBook Air. It features 9.1mm thick tablet which is being the thinnest of all the Intel Core products. Microsoft Surface Pro 3 seems to be first true replacement with a combination of laptop and iPad. It weighs about 800 grams and this has been made it through its comparison with the MacBook Air. This latest offering from Microsoft is really appreciable and users need to accept the notion that this is being the only device which can do everything. When users want to read e-books or watch some movies or videos then, this device works as a tablet while on the other hand, it works as a laptop when users need to get their work done. Microsoft did claim that Microsoft Surface Pro 3 will deliver on both but it does compromise a little. 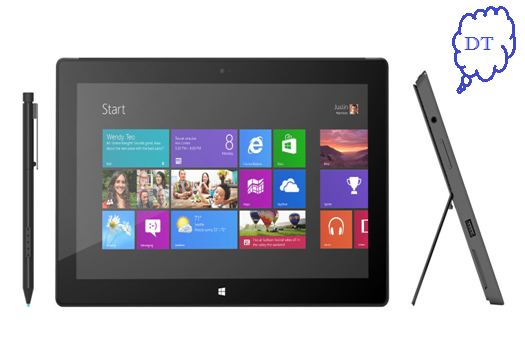 Microsoft Surface Pro 3 features full version of Windows 8 OS which is similar offering to any traditional PC or laptop. This particularly means that this device can easily run on with every program which is designed for Windows. Like other tablets, this latest Microsoft offering is equipped with a touch screen along with an optional cover revealing a physical keyboard and a touchpad. Furthermore, it features a USB port and its pricing is almost similar to other tablets available in the market. The touchscreen of Microsoft Surface Pro 3 is particularly sharp but still it is not at par with the Retina quality of the Apple iPad. With 12 inches display, this device is pretty large and even features aspect ratio of odd 3:2. The screen of the device is taller which a good compromise is really and it helps in giving the device a more real estate. Now, this device is featuring an improved keyboard which is wafer-thin and the trackpad is vastly improved as well. Keeping all about the weight and thinness, Microsoft designed Surface Pro 3 which even manages to pack about much more power than the MacBook Air. This device displays slightly more content as compared to the display of MacBook Air. It features high resolution along with the smaller footprint which made a significant effect on its battery life.